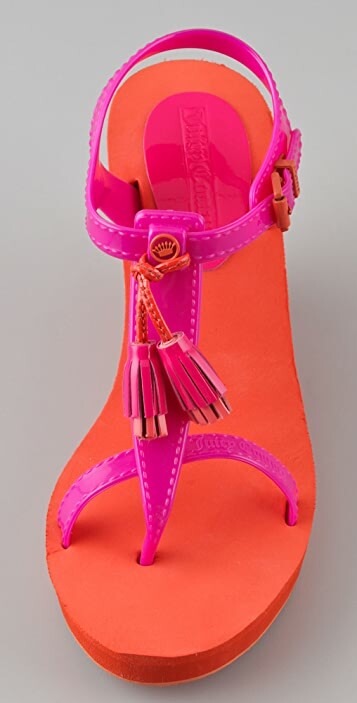 These rubber wedge sandals feature a tassel detail at the T strap and a buckled strap at the ankle. 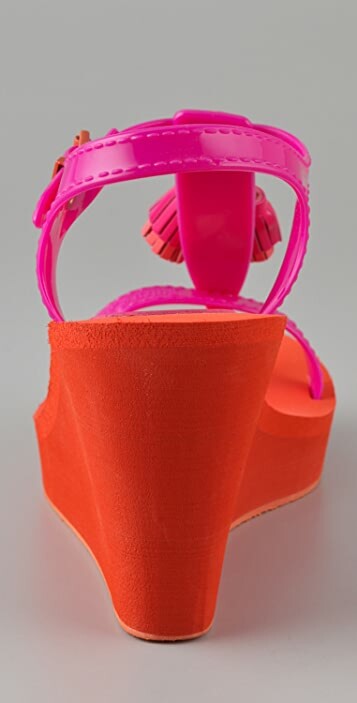 Matte rubber platform and wedge heel. Textured rubber sole. * Heel: 3.5" (90 mm). pretty soft. should have been ordering half size smaller. Thought these were too chunky and should've ordered them 1 size smaller. Sent them back. I fell in love with this sandals the minute I saw it online, it is beautiful, colorful, seemed practical and comfy, so I ordered it immediately, but unfortunately, the front straps are very stiff on the toes from the sides, which made it very UNCOMFY, it might be because of the material (jelly). I couldn't walk more than 5 minutes wearing this wedge sandals, so I returned it immediately. I wish I can find similar ones, cause they are very cute.